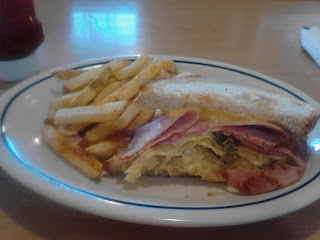 I love IHOP. There are many reasons why, but the biggest is you get a lot of good food at an exceptional value. That and the fact I am a complete fail at making pancakes. Seriously, for someone who can cook I can mess up pancakes like you wouldn't believe. So, I prefer to let IHOP make them for me. But, IHOP offers so many more options than just pancakes. “Breakfast sandwiches are the largest selling breakfast items out of the home, with more than 55 billion servings consumed each year. Our new Griddle Melts bring our guests a breakfast sandwich that lives up to our high standards of excellence and value and they can only be found at IHOP,” said Natalia Franco, Senior Vice President, Marketing, International House of Pancakes, LLC. 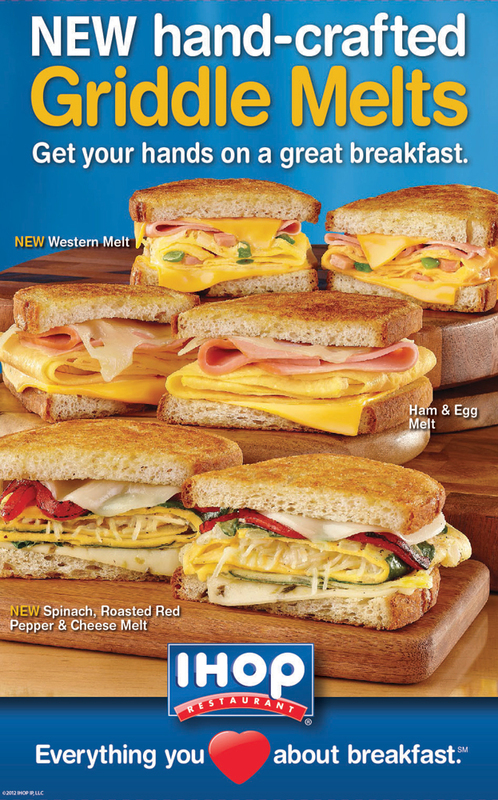 “Our culinary team has created three delicious varieties of Griddle Melts, each using the finest ingredients, and in a hearty size that requires both hands—even for the half sandwich. Sautéed fresh spinach in a fluffy egg omelet topped with roasted red peppers and onions, melted Provolone, Parmesan and Pepper Jack cheeses on grilled artisan sourdough bread. Served with your choice of hash browns, French fries or seasonal fruit. Smoked ham and sautéed peppers and onions in a classic omelet, topped with sliced ham, melted American cheese and served on grilled artisan sourdough bread. Served with your choice of hash browns, French fries or seasonal fruit. Sliced ham and melted Swiss and American cheeses over a fluffy egg omelet served on grilled artisan sourdough bread. Served with your choice of hash browns, French fries or seasonal fruit. I know that whet when it comes to a fast breakfast out, I often choose a breakfast sandwich. Admittedly, I would never think of going to IHOP to grab a quick bite, but after tonight I think it's a great option. I had a Western half sandwich with spicy fries. This cost $4.99. The sandwich was a Western omelet on tasty sourdough toast. The press release is correct, even the half sandwich took two hands. It was a delicious hearty meal at a great price. I was very pleasantly surprised, $4.99 normally doesn't get you such a filling meal. Not only was it a savory, affordable meal, but I was in and out of the restaurant in half an hour! That's a quick meal! I could not have been happier with my dinner. Not only was the food and value incredible, but so was the service. The place was fairly crowded with dinner customers, but I was greeted promptly with a smile. My server, Tammie, was very friendly and attentive. I was super excited that a coupon for a free short stack of pancakes upon survey completion printed off on my receipt, but they kept my receipt at check out. When I asked I was told they keep the receipts. This didn't make much sense to me, but was the only hiccup in a delightful meal out. So, I give the new Griddle Melts sandwiches two thumbs up! I am eager to go back and try the other two varieties! If you are looking for a savory meal and a great value I urge you to check these sandwiches out! 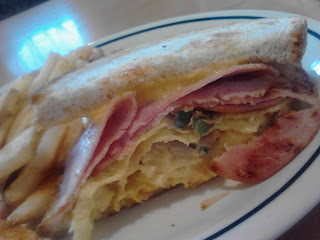 I received a gift card in order to visit IHOP and review the Griddle Melts sandwiches. No other compensation was received. All opinions are 100% my own.